This image illustrates all transition for me, because it is so easy to see and understand because it happens in such a short time, we can see it progress. 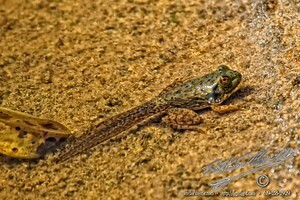 It is an image of a frog, or a tadpole? It is really a froglet. Froglets are usually seen with much shorter tails. Everything has a lifetime to live, and we change throughout that life, we only call it living in mankind, not metamorphosis as we do in frogs, because we do not lose a tail, or grow legs. … Or do we? Our most visual metamorphosis takes place unseen, in the wombs of our mothers, where we lose our tails, and gain four limbs. Most humans try to separate themselves from animals, I don’t. I revel in the flow of time, and I look forward to the continued evolution of myself, all life known and unknown, and the universe. This entry was posted in Animal, Fauna, Nature, Purchasable - As Art Prints, Water. Bookmark the permalink.